To access certain Google API web services a Client ID and a digital signature is required. A Client ID and a cryptographic key (used to generate a unique digital signature) are provided by Google once consumers have created an account. Before a REST web service request can be made, a digital signature must be generated and passed in as part of the URL, this process is known as URL signing. The cryptographic key, sometimes called shared secret/signing key must be kept secret and is never passed in as part of a URL request. A signing string (made up of the path and query of the request URL). A signing key (cryptographic key provided by Google). The correct encryption algorithm (Hash Message Access Control eg. HMAC SHA1, HMAC SHA2). To generate a digital signature requires the following 3 steps. 1) Construct request URL, the URL must be percent-encoded/URL encoded to ensure it is valid. A URL is made up of reserved and unreserved characters. Reserved characters in a URL have a specific purpose, for example a ‘/ ’ separates the different parts of a URL. If a ‘/ ’ is required in a URL for any other purpose, then it must be percent-encoded to distinguish it from its reserved counterparts. Percent-encoded reserved characters are always preceded by a ‘%’ to indicate percent-encoding. To percent-encode a URL’s reserved characters, use the pair of hex digits which corresponds to each reserved character’s ASCII value, finish by preceding each hex digit pair with a ‘%’. If any reserved character is non-ASCII then use the pair of hex digits which corresponds to its UTF-8 character instead. The address parameter contains spaces, spaces are not allowed in a URL, it also contains a '&'. This URL must be encoded by replacing spaces with a '+', and replacing '&' with the two hex digits corresponding to its ASCII value. To see a list of reserved/unreserved characters and additional information on URL usage, go to the following link. Omit the protocol and host, leaving only the path and query, now you have the signing string. 3) Generate signature using signing key, signing string and encryption algorithm. Google provides a C# method for developers called ‘Sign’, this method accepts two string parameters and returns the signed URL request in full as a string. When calling this method the full URL and the signing key are passed in as the two parameters of type string, see the method below. // replace '-' and '_' characters first. // Add the signature to the existing URI. A signature parameter is attached to the end of the URL, and the fully signed request URL is returned as a string. Using this process a request can be made to any Google web service which requires a digital signature. In some cases SSL (Secure Socket Layer) is used to provide transport level security when making requests. In these situations change the protocol from ‘http’ to ‘https’, before making the request. All Yahoo API web services are free to consume at present. Once service consumers have signed up for an account with Yahoo, they are assigned an API Key/Application ID. When making a REST web service call the API Key must be included in the URL request. Places the username and password together to create the following string, which is then encoded using base64. The Delicious API also uses Secure Socket Layer (SSL) for transport level security, the https protocol is used instead of http when making a request. Some service providers use HTTP-Auth and SSL in combination. There are two types of web service requests that can be made to Amazon Web Services (AWS). Anonymous requests are made to freely available services using an Access Key ID which is issued when consumers sign up for an account. This key is included as a request parameter in all requests made to AWS. Authenticated requests must contain a request signature, in other words the URL must be signed using a generated digital signature. AWS Access Identifiers are an Access Key ID which is your identity/username and a Secret Access Key which is your password. The Secret Access Key must be kept secret and is never used in requests, it is instead used together with an encryption algorithm during the signing process. The Secret Access Key is a 40 character alphanumeric sequence issued to consumers by AWS. 1) Construct your request URL. Attach a time stamp to the end of your URL. For more info on UTC format TimeStamp, see the link below. 3) URL encode any reserved characters used by query parameters. The ResponseGroup parameter contains comma’s and the TimeStamp parameter contains colons, comma’s and colons are reserved characters. To URL encode a reserved character, use the hex digit pair corresponding to the reserved character’s ASCII value, then precede the hex digit pair with a ‘%’. 4) Re-arrange URL query parameters in byte order to produce the canonical string. Capital letters come before lower case letters. A parameter name beginning with the capital letter 'D' precedes a parameter name beginnig with 'a', the names are NOT in alphabetical order. The above is the canonicalized query string used to generate a signature. 5) Prepend Verb, Host and Path lines (preceding canonicalized query string) with a line break. Each of the verb, host and path values must be on separate lines, and they must precede the canonicalized query string. 6) The signing string in full. 7) Compute digital signature using signing string, Secret Access/Signing Key and a hash algorithm. The encryption algorithm can be HMAC SHA1 or SHA256. Amazon provides code samples in a variety of languages available to download for their Flexible Payment Service, the samples include code for generating digital signatures, see the following link. For more information on the Secure Hash Algorithm (SHA) see the following link. 8) URL encode reserved characters in the signature. + and = characters in the signature must be replaced by hex digit pairs. 9) Create a signed request by attaching the signature to the end of the request URL. The above recipe can be used for Amazon's Product Advertising API and Amazon's Flexible Payment Service. For more information on the product advertising API see this link. Sending a signature as a URL query parameter is not the only way to sign requests, a signature can be sent instead by using the Authorization header. See below for an explanation on how this is achieved using Amazon's S3 storage service. The format of a signing string when using query string authentication instead of an Authorization header involves a minimal change, replace the DATE header value with an Expires parameter value. The Expires parameter value indicates when you want the signature to expire. The Amzheaders are any headers that start with x-amz-. The string to sign must be URL encoded (UTF-8 encoded). The content-type and content-md5 values are optional, if their values are not included in the string, newlines (\n) must still be included where the values would have been placed. The resource value is the bucket and key values separated by a '/ '. The XElement class represents an XML element. All elements in XML have names, they may or may not have attributes or content. The namespace System.Xml.Linq is required when working with XElement. The following link provides information on the different types of content an XElement can contain. For more information on the XElement class from the Microsoft site see the following link. The following link provides details on members the XElement type exposes. The XML produced matches the standard XML format. As more XElements objects are added as content arguments an xmlTree can be created. In addition to the XElement class, there is also a XDocument class which can be used to create XML documents. The following link provides information on this class from the Microsoft site. Working with XElement is far simpler than working with XDocument objects. The following code snippet creates an xmlTree. The above example is not the only way to create an xmlTree, XElement’s Parse method can be used to create an xmlTree from a string containing XML. LoadOptions set to None will not preserve white spaces or retain line information. If this is required then set LoadOptions to LoadOptions.PreserveWhitespace or LoadOptions.SetLineInfo. Please note, using LoadOptions.SetLineInfo will mean taking a performance hit. Using the code snippet above, the XElement object ‘xmlTreeExample2’ can be saved in an XML file. The Load method allows an XElement to be loaded from an XML file. The Load method can also be used to load an XElement from a TextReader, xmlReader and using a stream an XElement instance can be created. See the following link for more information on these alternative methods. LINQ to XML is an approach to programming XML in .NET using LINQ query expressions. Query results can be used as parameters in XElement and XAttribute objects when creating xmlTrees. This functionality(known as functional construction) allows xmlTrees to be transformed from one shape to another. The following code snippet shows how to retrieve the value of the element ChildElement1 from each parent element in xmlTreeExample4. The following code snippet shows how to retrieve the value of the element GrandChildElement1 from each parent element in the xmlTreeExample4. To retrieve the values of all descendants of each Parent element the following code shows how this can be achieved. There are a number of ways to create a rest web service in visual studio. 1)Convert an existing WCF soap web service into a WCF rest web service. The following 15 minute video shows how easy it is to accomplish this. The starter kit contains various templates to speed up the process of creating services. The templates include an Atom Feed WCF Service, AtomPub WCF Service, HTTP Plain XML WCF Service, REST Collection WCF Service and a REST Singleton WCF Service. ASP.NET Web Application project template - this project is used to create a rest service. It contains a service contract class with operation contracts and data contracts. A Web Service template is also added to this project, this template is a visually designed class for creating a web service. This is where the implementation code for the operation contracts of the web service will be placed. Windows Forms Application project template - used to host the rest web service. This project contains an app.config file and a code file with service host code. Service Orientated Architecture (SOA) and Web 2.0 technologies can help organizations implement Cloud services in their IT environment. The following diagram shows the layers of an emerging Enterprise Computing Stack. Web 2.0 allows for building user interfaces and collaboration. Within an organisation this technology is referred to as Enterprise Web 2.0, it can be delivered using enterprise portals such as Microsoft SharePoint, Oracle WebCenter Suite and IBM Websphere Portal. SOA enables the building and integrating of applications improving business agility. SOA can be used to take advantage of Cloud services and present these resources to the users via Web 2.0 technologies such as AJAX, Mashups, RSS and enterprise social computing. SOA greatly reduces the risks when building Hybrid cloud environments by providing a more integrated on-premise and public cloud solution. SOA also makes it easier to move services between Cloud environments. If an organization doesn’t have an on-premise cloud, having an SOA environment helps to identify and integrate public cloud services into the existing environment. Infrastructure as a Service (IaaS) provides hardware and system software as a service including Storage, Compute and Networking. These services provide access to IT infrastructure components. Software as a Service (SaaS) is application software delivered as a service. These Cloud layers can be implemented individually, they do not depend on one another. SOA principles can be applied when building the Cloud layers. 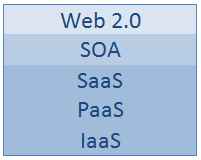 SOA architectural principles for example can be used to build a service-oriented Infrastructure as a Service (IaaS) layer. The SDK includes an off-line test environment called 'Developer Fabric', it is a simulation of Azure(Cloud Fabric), the subscription based production environment running in Microsoft's data centers. The SDK provides dev's with APIs, tools, docs and code samples to help develop app's on Win Azure. This download includes Windows Azure SDK and can be used with VS2008 & VS2010. Dev's can create, configure, build, debug, run, package and deploy scalable web app's and services. A Windows Azure training kit is available to download, it comes with hands-on labs, presentations and demos designed to help you learn how to use Win Azure, SQL Azure and AppFabric. The June 2010 release includes new and updated labs for VS2010. There are 4 portals associated with Windows Azure platform, 3 are subscription based the other is free to use. A windows Live ID is required to sign-in to these portals, you can sign-up for a Live ID on any one of the portal sign-in pages.